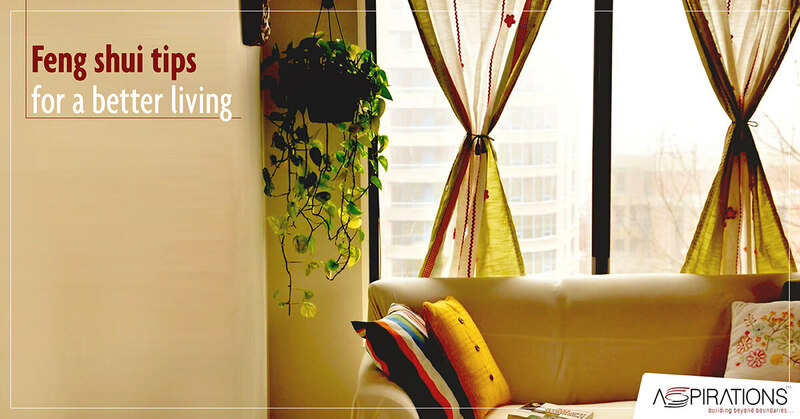 The concept of Feng Shui has always been an integral part of the art of living since ages. In simple terms, the idea is associated with the Chinese idea of the immanent power of Chi that keeps on pervading and flowing through spatial arrangements. With Aspirations apartments for sale in Kolkata, you get to make your dream come true even more enchanting by incorporating simple ideas for your living rooms. Since Feng Shui is all about the constant flowing of energy, the primary objective must be to declutter your living room. A clean room is also psychologically beneficial providing positive vibes. Start by maintaining negative spaces and removing the excesses. Bonsais have an essential role to play in the wellbeing of man. When you are a part of Aspirations residential complex in Kolkata, make your living energetic with sturdy plants like the jade tree or the money tree. The former not only with its good looks imparts aesthetics to your room, but also provides vibes that make your entire family happy. The latter bonsai maintain the influx of money optimum. Consulting Feng Shui energy map before getting a paint job done is also essential for the flow of Chi. Living rooms when coloured with lighter shades, the reflection of energy is maximum. Shades of light yellow, red, green are important in the study of Feng Shui and when used in living rooms has shown significant improvement in relationships with better bonding. Aspirations top residential project in Kolkata are designed in accordance to Feng Shui curriculums to provide more vibrancy. Since mirrors play an important role in the development of the human psyche, a strategic location of the mirror within the living room makes the influx of Chi energy reflective. The rejuvenated environment starts affecting us at the unconscious level. Since Feng Shui is all about nature, try incorporating and honouring all the Feng Shui elements like wood, water, earth and metal within your room’s premise for a healthy and wealthy family relationship. As the outside is always a defining factor for a man’s inside, unhindered flow of Chi is assured to bring joy to your life. Get in touch with Aspirations apartments for sale in Kolkata today. Copyright © 2018-19 | Aspirations Group | All Rights Reserved.